. :: Tabernacle Pentecostal Church Kristus Kasih - Malang - Information tabernacle equipment: the curtains of the tabernacle ::. Curtains or coverings are to “protect” whatever is inside, namely the Tabernacle, from all the outward (external) influence. The Lord also protects His church, which is called His Body (Ephesians 5:23). 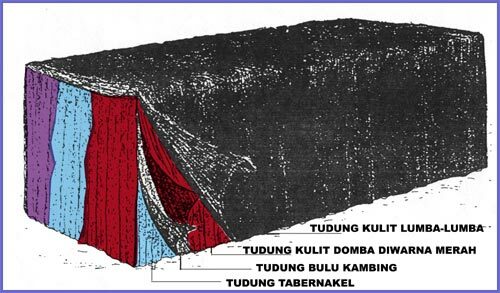 The curtains of the Tabernacle (the first covering). The word curtain or covering has the same meaning as clothes, which are used as a covering for body, but it also refers to the daily conduct. The curtain has the same color as the Gate, the Door of the Tabernacle and the veil (Veil + Ephod), which speak of: faith and deeds of faith. The congregation as the living Body of Christ should live by faith and the deeds of faith; for whatever is not from faith is sin (Romans 14:23). The curtains of goats’ hair (the second covering). Hair signifies holiness, so the spiritual significant of the curtains of goats’ hair is: holiness and the holy deeds. The congregation is the Body of Christ that should be holy in all her deeds. The covering of ram’s skins dyed red. This third covering has no measurement. It different from the first and second coverings. Red is the color of blood. Ram is an animal used as a burnt offering and a wave and heave offering in the consecration of priests. So the spiritual significance of the ram’s skins dyed red is: God’s love in His surrender and consecration. God’s love is without limit and without measure. The covering of badgers’ skins. This fourth covering is also without certain measurements. The badgers’ skin is the skin of seal. Its skin is very tough and weather –and-air resistant. This covering is not beautiful as the other coverings. It is the upper covering so it is exposed to storms, rain, strong wind (squall) and other weather conditions. The badgers’ skin speaks of judgment. For example: Noah’s Ark sheltered/protected 4 married couples against the judgment of God in the form of flood. God’s judgment is without limit (without measure) if man rejects God’s boundless love Christ endured God’s judgment to protect and to save us (Galatians 3:13). He was so uncomely to look at (Isaiah 52:13-14; 53:2-3).